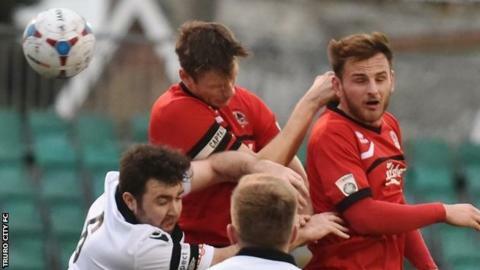 Truro City manager Steve Tully felt his side should have scored more goals as they beat nine-man Eastbourne Borough 1-0 in National League South. Shane White's 40th-minute penalty proved to be the winner after Borough goalkeeper Lewis Carey was sent off. Eastbourne also had Craig Stone sent off for a second booking late one. "When you're a player up, especially when they haven't got a recognised goalkeeper, you should always go on and punish them," Tully told BBC Cornwall. "We perhaps didn't do that, and fair play to Eastbourne, they never gave up and were a tough team in the second half, but I'm delighted with the three points and it keeps us moving along nicely." The win keeps Truro in eighth place in the division, two points off the play-off places. Read more on Four Premier League games - can Brighton ease relegation fears?